To me, the Grand Canyon has always meant the South Rim. It just seemed so much more accessible to me, as it was easy to hop up to from Phoenix or I-40. And its proximity to the stunning landscapes of Sedona was a huge bonus, too. But on a recent trip to the national parks of southwestern Utah, I discovered the unique charms of the North Rim. My partner and sons had never seen the Grand Canyon, period—so we decided to head to the North Rim for a day in between Las Vegas and our planned home base of St. George, Utah. A friend who has been to the Canyon multiple times had raved to me about the solitude to be found on the north side, and I was intrigued. The trip to the North Rim is rather out of the way, for sure—it was about a four-hour drive from Las Vegas, but the scenery was gorgeous and varied. And the trip back to St. George was another 2.5 hours, making for a lot of time in the rental car. But we left very early from our Vegas hotel, allowing us to spend a good six hours exploring the park. First, let’s get the issue of Canyon views out of the way. The view from the opposite rims (North and South) is equally breathtaking, and I can’t say that either was more magical for me. At the South Rim, you have the ability to drive along much more of the Rim boundary, giving some different perspectives. At some point, however, you can reach amazing-overload, not unlike along some stretches of California’s Highway 1. Each new corner turned doesn’t disappoint, but you can only take so much in before a sense of view-monotony creeps in. The other practical difference between the two Rims is that the South has a great deal more facilities and visitor services, with the whole Grand Canyon Village area and a small airport. But what I really enjoyed at the North Rim was the fact that it was more remote. The number of visitors was a small fraction of what I’d come to expect as normal at the southern end. Trails were uncrowded, and I felt like our experience was more in tune with nature, without encountering hordes of selfie-taking tourists at every turn. The North Rim Visitor Center has a nice selection of recently updated interpretive exhibits, as well as restrooms, drinking water and regularly scheduled ranger programs. 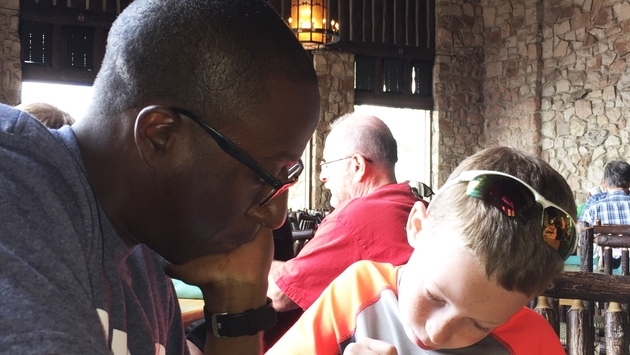 We stopped for a delightful lunch at the Grand Canyon Lodge’s restaurant, salivating at the view from the expansive windows. Afterward, we let our stomachs digest a bit on the back patio while enjoying the Adirondack chairs overlooking the Canyon. The North Kaibab Trail is the only one that heads into the Canyon itself, and even a couple of miles along the trail will give you a sense of the enormity of the canyon walls around you as well as the distance to the bottom (it is 14 miles to the Colorado River from the summit, so certainly not a day hike kind of thing!). Staying up on the Rim, the Bright Angel Point Trail was a very easy paved trail that was less than a mile and afforded many lovely vistas along the way. And the Transept Trail, a few miles in length, heads to the North Rim Campground from the Lodge. Take plenty of water on all hikes and take note of how hot the day’s temperatures are expected to be, especially if you intend to hike partway into the Canyon. 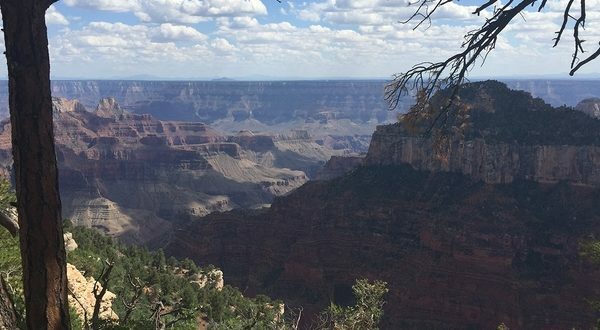 If you’re more adventurous or have a few days, there are more than a dozen different official trails that are accessible from the North Rim—plenty to keep you enjoying those quieter Canyon views.